Welcome to CS Boats. We specialise in fitting out quality sailing dinghies, and supplying them measured and ready to race, i.e. Albacore. We use quality hulls and apply our skills in fitting it out. We are continually developing the fit-out to meet our customer’s needs and we also offer bespoke fit-outs. We will be looking to expand our range of dinghies offered once our new workshop is in place. We are a small family run company based in the Wiltshire, with a North of Scotland outlet. All our new boats are delivered free to any UK mainland location. We also undertake work restoring dinghies and we offer a constantly expanding range of spares, from foils, spars and fittings. New take delivery of a new sewing machine Wednesday 28th March. This will enable us to increase the range of products we make. Jacqui is going to be busy. Click on New Sewing room to see pictures of our New sewing room ready for Jacqui to move into, this gives a larger area for Jacqui to work in. No more struggling to do things in a small space. We now have an Ebay shop, currently with some Harken blocks on it. We will be listing all our surplus stock at Bargain prices on it, so keep an eye on it. Michael McNamara wins Nottingham Albacore Open (3rd September 2017) in his new Albacore 8225 fitted out by CS Boats. Winning all three races. 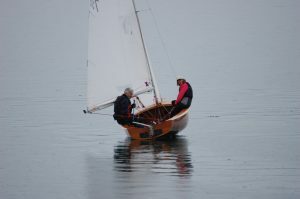 We are a small family run company building, restoring and making soft furnishings for dinghies, based in Wiltshire.